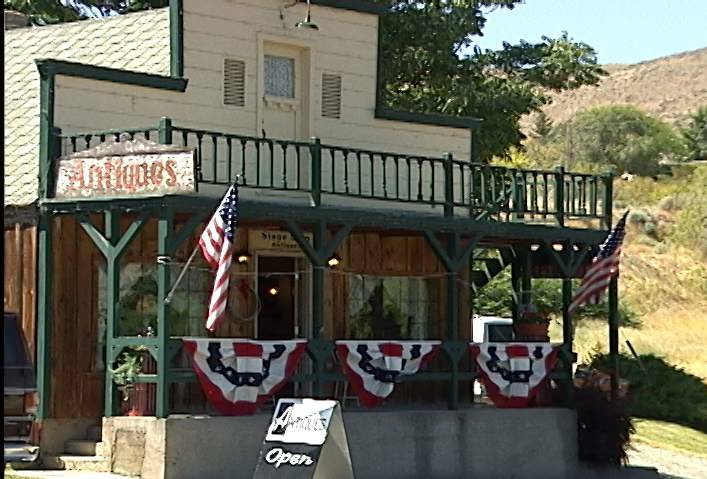 IIn 2005, I had the pleasure of talking with Carole Crim at her Stage Stop Antique Store in Chelan. She agreed to let a camera roll while we discussed one of her favorite subjects: apple labels. At the time of this recording, she admitted to thirty-five years of immersing herself in them. 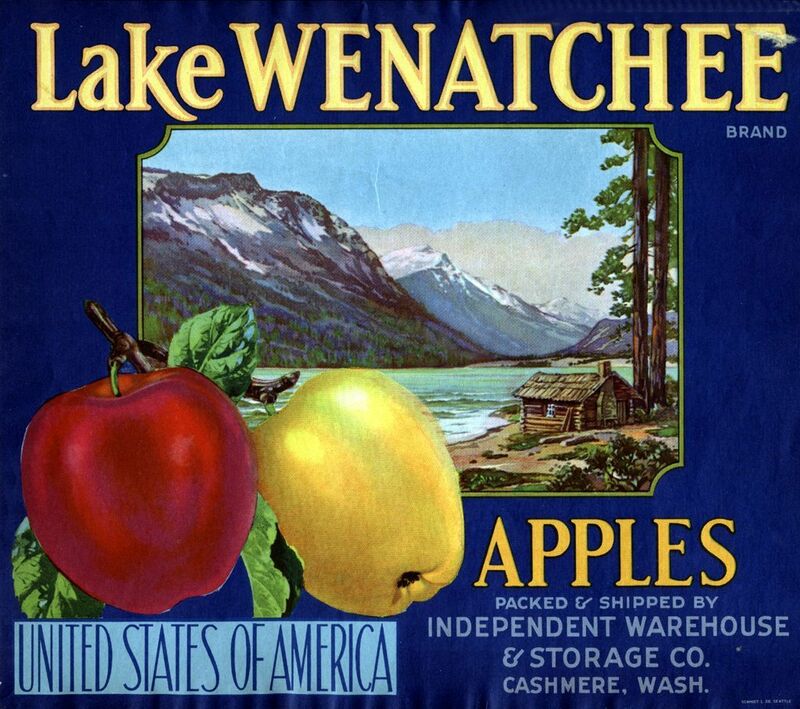 Carole loved the art that adorned the old wooden apple boxes - colorful advertisements that made Washington apples famous. Carole shares how she became both a collector and a dealer, and how she amassed an impressive collection of 3,000 different labels along the way. 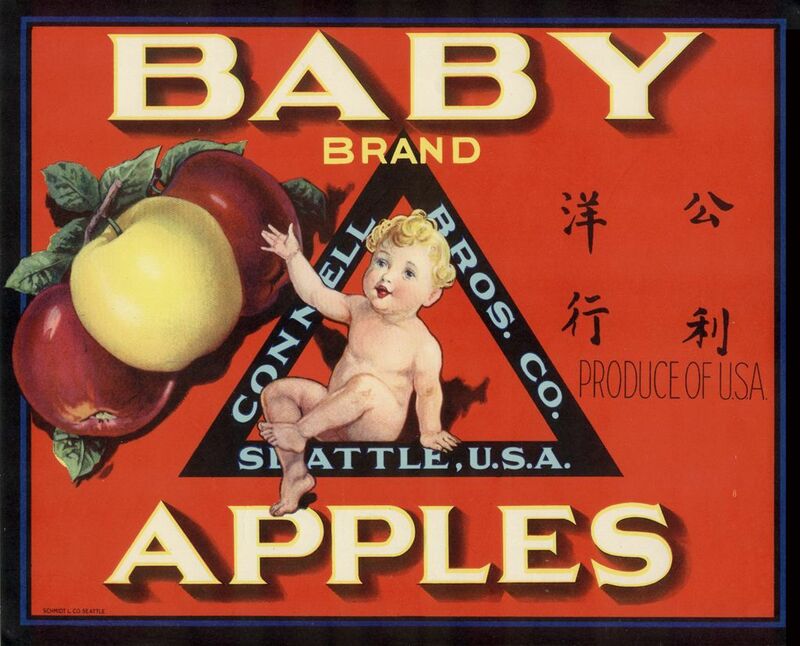 How did you get started collecting apple labels? CAROLE CRIM - Collecting has probably been in my blood. I think you are born with being a collector. 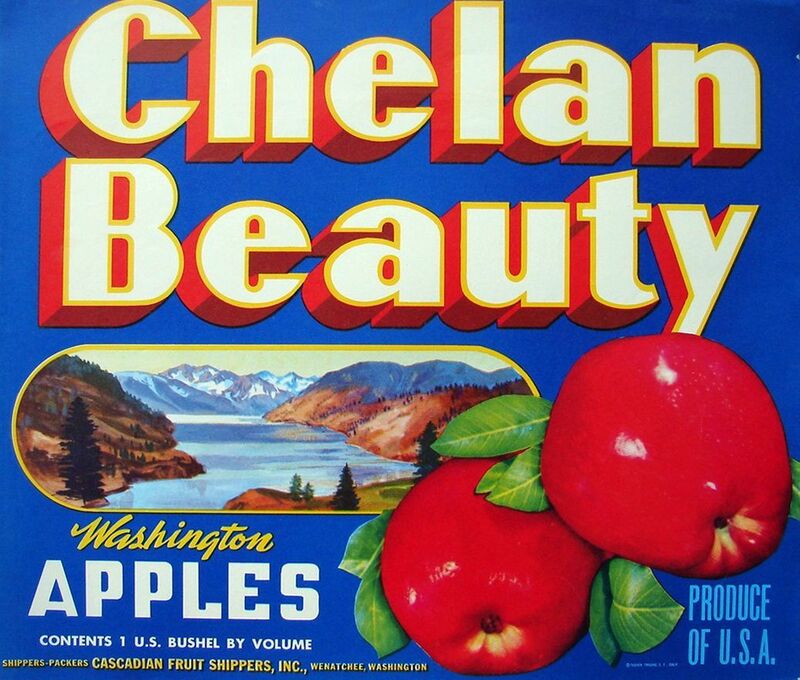 And when I got into Apple labels it was a whole new world because they are so graphic and so pretty. 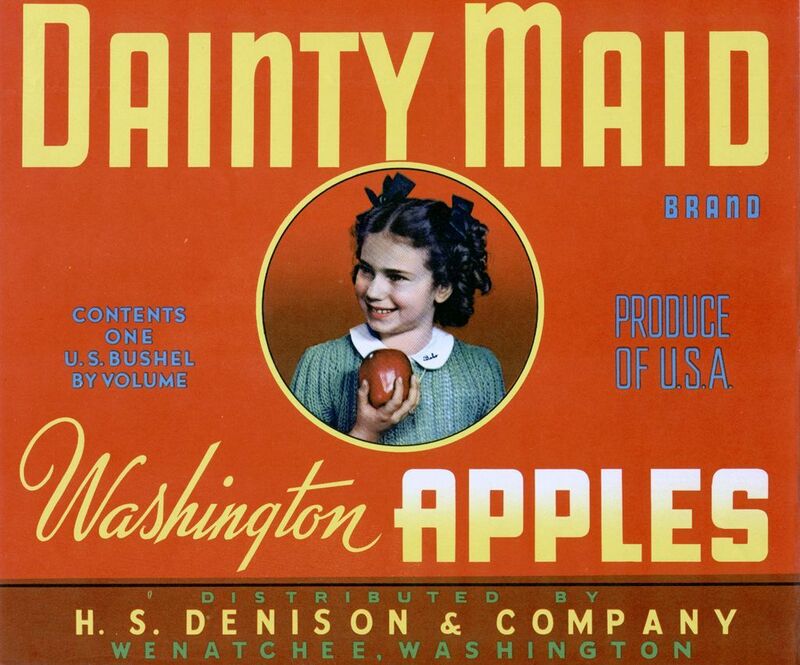 And, both my husband and I have been collectors of postage stamps, and as probably - at least seventy-five percent of the people who collect apple labels also collect postage stamps. But, when you have a little teeny thing, and all of a sudden, this beauty becomes bigger - it's much more fun to go out and seek them than just on an end of an envelope or something. 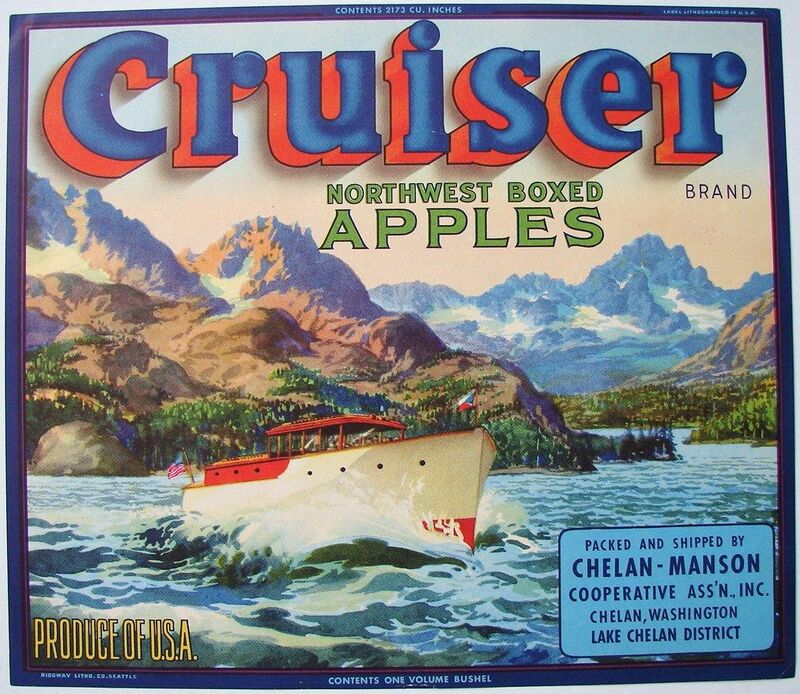 And, so we got into the graphics of the apple labels, and once you get two or three, then you got to have a whole bunch more. And, then you start collecting different companies, and different areas and you just go on and on and on and on. And, there are so many out there, and almost weekly you can come up with a different apple label - where, postage stamps - you run out of things to do. 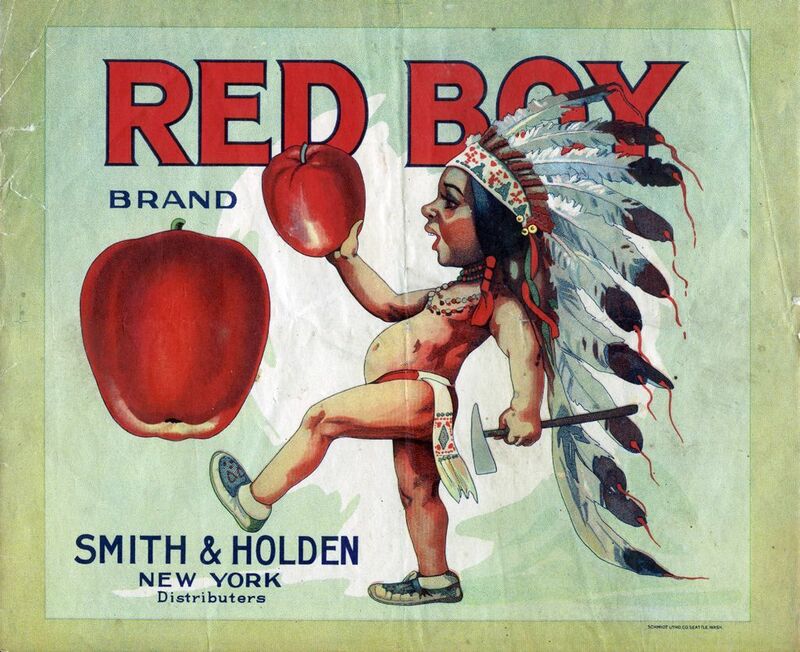 So - kind of that's how I got started in collecting on the apple labels - but because they were local - they were local history. 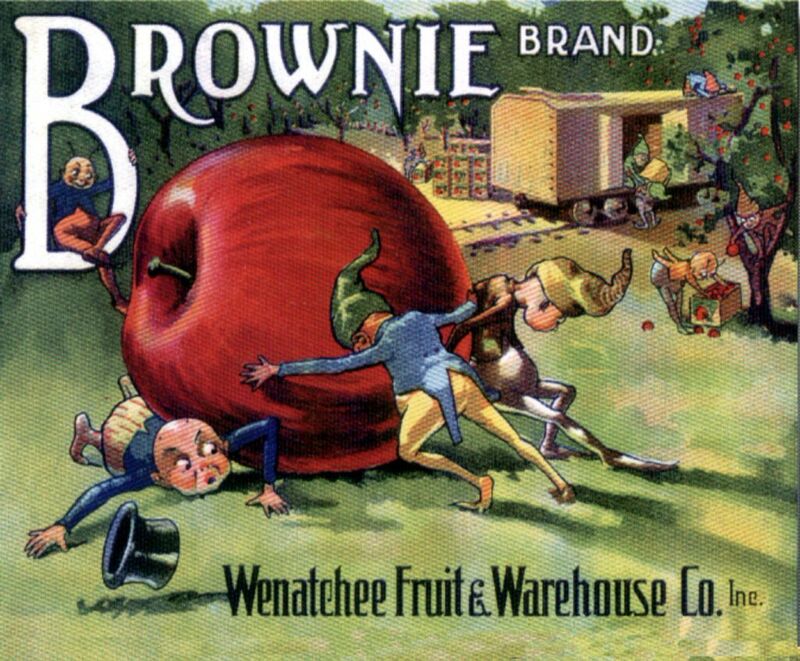 CAROLE CRIM: There's so much to learn in the field of collecting Apple labels. 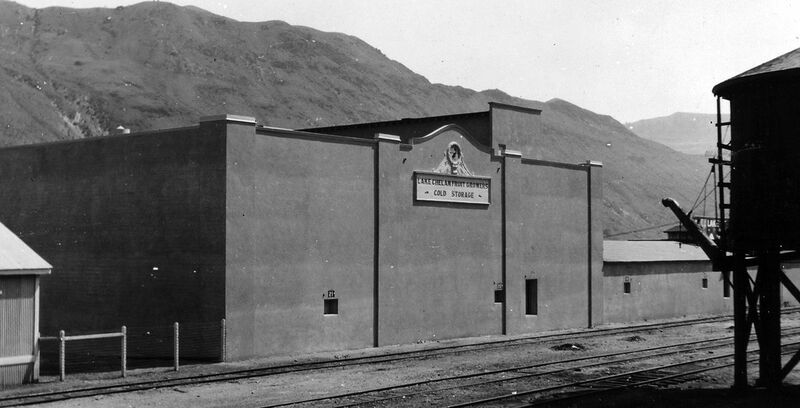 I started personally about 1970 when the museum (Chelan Museum) was opening. They were given a bunch of materials like graders and actual machinery that were in the sheds themselves that were outdated. Well, they never did utilize those, but I decided they had to have some color, so I went down to the sheds at Chelan Falls. And that's when they told me that I could have any I wanted but not to break a bundle which is about 800 - if you break them - take the string off - well, then they're on the floor. So they didn't want to do that. So I started bringing home big gobs of them. And it was about time I started the business, so I put him out on the counter and start selling them five for a dollar. My competition across the street -he went down and got some. And, consequently, he raised his price, and I raised mine, and then we would trade with - I would trade with other people as they came into the shop. There was one guy from Yakima - his name was Bob Hansen. He was into the charcoal that went in the filters of the CA storage units which are quite was quite new in 1970. So, he was all the way from the Yakima Valley up north, and he would stop by, and he'd bring some of the Yakima labels. Well, then I got to - I had to have some more of those, and I'd trade him a pinch of his for a pinch of mine, and that's how that got started. 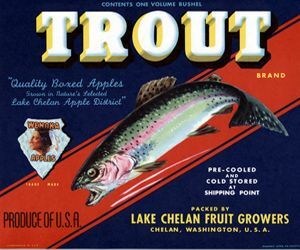 But Dave Hart also had a collection, and he was from down at the Trout shed and, and he had been there many years then, and he used to trade with the truck drivers who would bring them in from different areas. So, it just snowballed. First thing you knew there was a lot of people in it and people from California came up and bought up all the local labels and took them back to California. Just on and on and on. And, here it is 35 years later, and I'm still doing it, still enjoying it, still enjoying the people that we see quite regularly that collect. And, there's just such a world out there in the graphic arts field and advertising that's so much fun. How many labels are in your collection? CAROLE CRIM: Oh, probably 3,000, but my collection versus somebody else's - they might have 3,000 that are all different. So, every time you see something different you want another one. 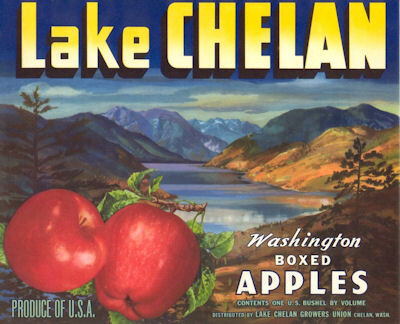 When you consider the Yakima Valley, the Wenatchee Valley, the Chelan Valley and then on up to the Canadian border. And then even into Canada. There's lots of pretty Canadian labels. The Canadians don't think much of our labels, but I do of theirs. Very rarely do they want one of our labels. I don't know why. But that's the way it is. 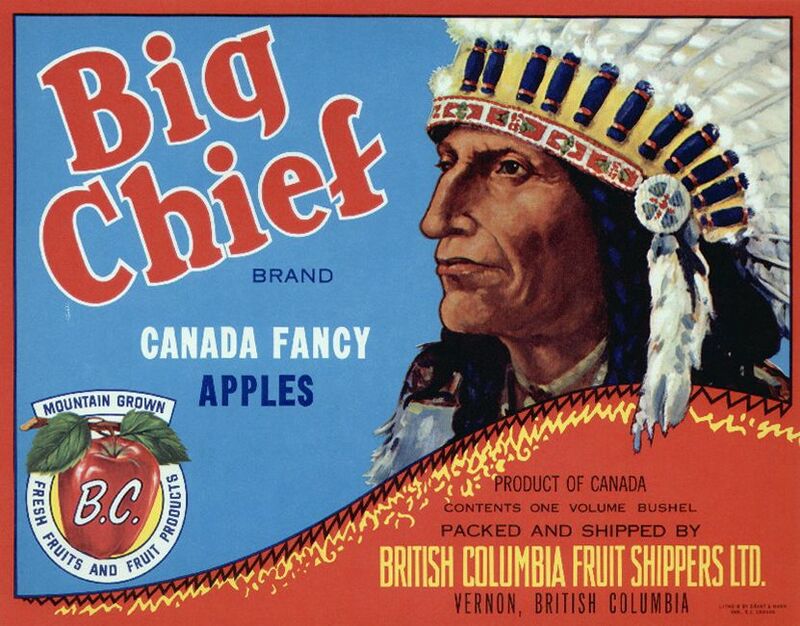 In fact, there's two dealers that drop through every once in a while, and they'll buy back their Canadian labels from me or by buyback, I mean they buy them here, take them home, but they don't want the U.S. labels. They say there is no market for them in Canada. Why? 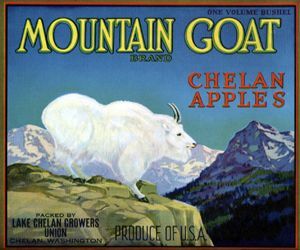 I don't know, because they have so many pretty - they used a lot of animals on their labels and then - a lot of generic labels, too that are very fun. You might find the same label with ten different growers on it - or shippers. So it's another aspect of the hobby. 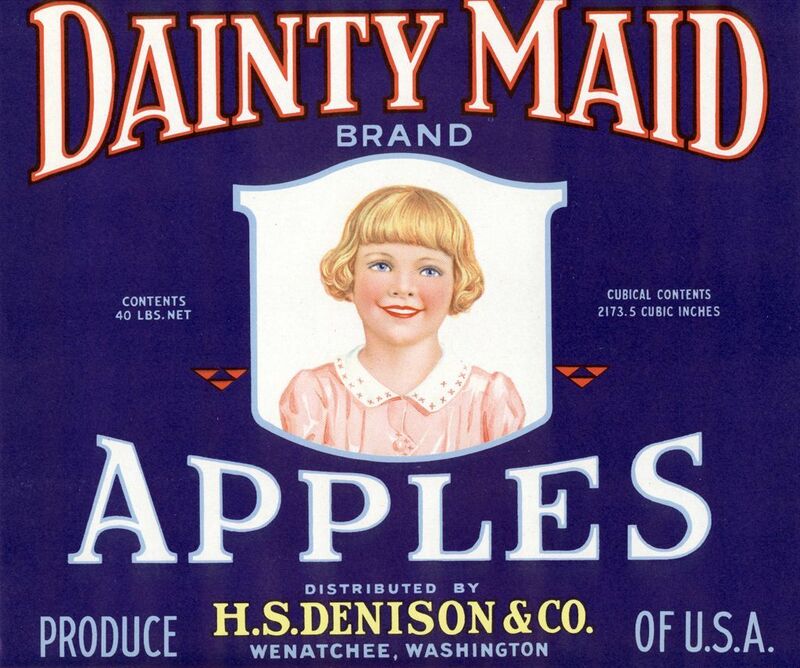 I also talked to people who worked at the peak of paper apple label use. Watch a three minute video with vintage film and photographs. How do you date a vintage label? CAROLE CRIM: (The) Oldest one that I have is1909 - iis about the earlest one - dated label. I think there werewere some before that because they were shipped out in the very early days and I think probably when the railroad came through I don't imagine the first cars shipped were had labels on them because I never found any - too many of that era. 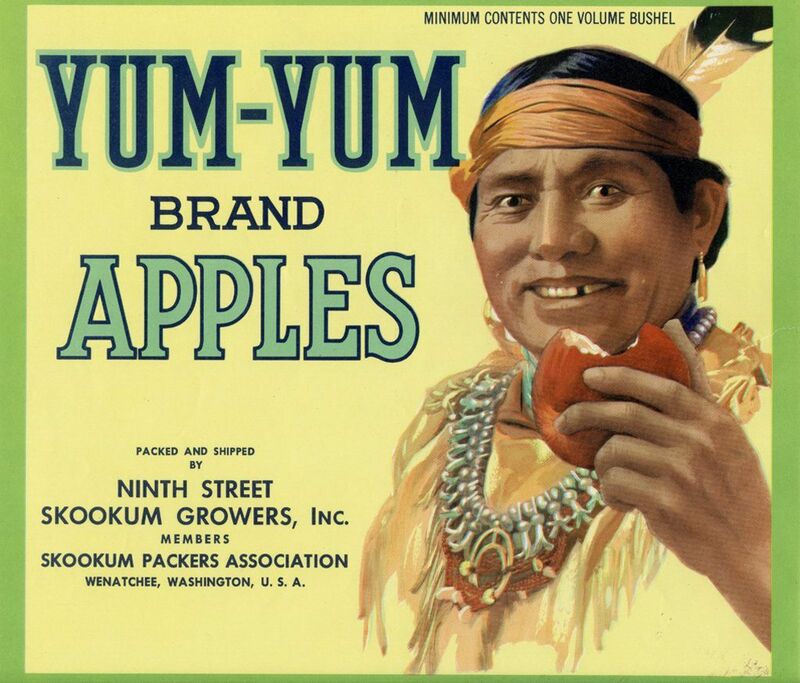 But, Skookum patented their label in 1916. And that's another dated one - but you-you look at someone you just know they have to be about 1910 - 1915 era, but there's no dates and very few or dated unless there is a copyright on them. If there's a large border and if there are lithographed then they are usually much earlier. When they got up into the 40s they took the boarders away. And, even before the 40s they started cutting down the size of the border so that the image was bigger. But, when they got into the 40s and 50s they did away with the borders altogether and you can kinda go by that and by how people are dressed, the cars, or the trains or different features of the label, like the Columbia Belle, she's all dressed in red white and blue, holding a torch up. And then there was Uncle Sam and of course some of them were even called back to like World War I can't think of one. For instance some World War I right now unless know the Columbia Belle I'm sure came later than that. But, there was lots of different images that denoted the times.